There are three main types of skin cancer: basal cell carcinoma, squamous cell carcinoma and melanoma. Each type of skin cancer is named after the type of cell from which they originate: basal cells, squamous cells and melanocytes. If left untreated, these cancers can become life threatening. Basal cell carcinoma (BCC) is the most common but least dangerous form of skin cancer, accounting for about 70 per cent of all skin cancers in Santa Monica. A BCC appears as a lump or scaly area. It may be red, pale or pearly in colour and as it grows, it may become ulcerated like a sore that won’t heal. A BCC grows slowly and is most commonly found on the head, neck and upper torso. It is important to remember if there is one BCC, there is likely to be another occurring now or in later years. Squamous cell carcinomas (SCC) are less common than basal cell carcinomas (BCCs) and account for approximately 25 per cent of all skin cancers. 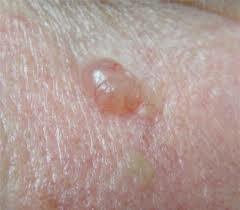 They are not as dangerous as melanomas but can potentially spread to other parts of the body if left untreated. 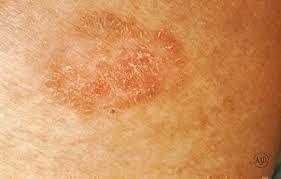 An SCC may appear as a thickened, red, scaly spot. It may bleed easily or be ulcerated. An SCC usually appears on areas of the body most often exposed to the sun and usually grows over some months. Melanoma is the least common but most dangerous form of skin cancer accounting for approximately 5 per cent of all skin cancers. 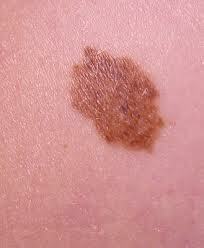 A melanoma appears as a new spot, or an existing spot, freckle or mole that changes colour, size or shape. Usually, a melanoma has an irregular or smudgy outline and is more than one colour. A melanoma grows over a period of weeks to months and can be anywhere on the body, not only in areas frequently exposed to the sun. If left untreated, the cancer cells can spread to other parts of the body. Most deaths from skin cancer are the result of melanomas. Solar keratoses, or sunspots, are not a form of skin cancer but, like skin cancers, they are the result of sun exposure. Sunspots are scaling spots, which are red or occasionally brown in colour. They appear on areas of the skin that are most frequently exposed to the sun such as the face, ears, neck, forearms and hands. Occasionally, sunspots may develop into a skin cancer, however the probability is low. Sunspots are a warning sign. They occur on skin which has had enough sun exposure to develop skin cancer and skin cancers are more common in people with sunspots. If you have sunspots you should watch out for signs of early skin cancers and take extra care when out in the sun. Moles are harmless, coloured spots that range from one millimetre to ten millimetres in diameter, are uniform in shape, even-coloured and may be raised. Some have uneven borders and multiple colours like brown and black. The more moles or freckles you have the higher your risk of sun damage, so if there is any sign of change, see a health professional immediately. Seborrhoeic keratoses are spots with a clear edge; they look like they sit on top of the skin. They vary in colour from pale brown to orange or black and vary in size from a few millimetres to two centimetres. Most people have a few of these spots by the age of 60.